The Marco Polo regularly offers cruises from Bristol and other UK ports and is operated by UK-based Cruise & Maritime Voyages. She is a smaller ‘Ocean Liner’ from a bygone era. Marco Polo entered service in 1965 as one of five almost identical sister ships for the Russian/Ukrainian fleet. She was named after the Russian poet Alexandr Pushki. She was originally operated by the Russian ‘Baltic Shipping Company’ on the regular trans-Atlantic service between Montreal, Canada and Leningrad. To enable the ships to navigate through broken ice, they were constructed with greater hull strength and stability than usual in passenger ships of her size. These ships were also built troop-ship usage in mind. Therefore they had an unusually large provision storage areas, enabling a cruising range of over 10,000 nautical miles. As built, the ship carried around 700 passengers in two classes, additionally there were provisions for 500 cabin-less passengers. The ship underwent many internal changes to her accommodation, public rooms and to her mechanical aspects. In 1991 she was purchased by the Orient lines and re-named ‘Marco Polo’. The ship had several more owners, including NCL and is now under charter to UK-based ‘Cruise & Maritime Voyages’. In fear of stating the obvious: cruise products vary vastly in cost, quality and their target clientèle. The Marco Polo offers cruises from Bristol and other UK ports, often at budget fares. 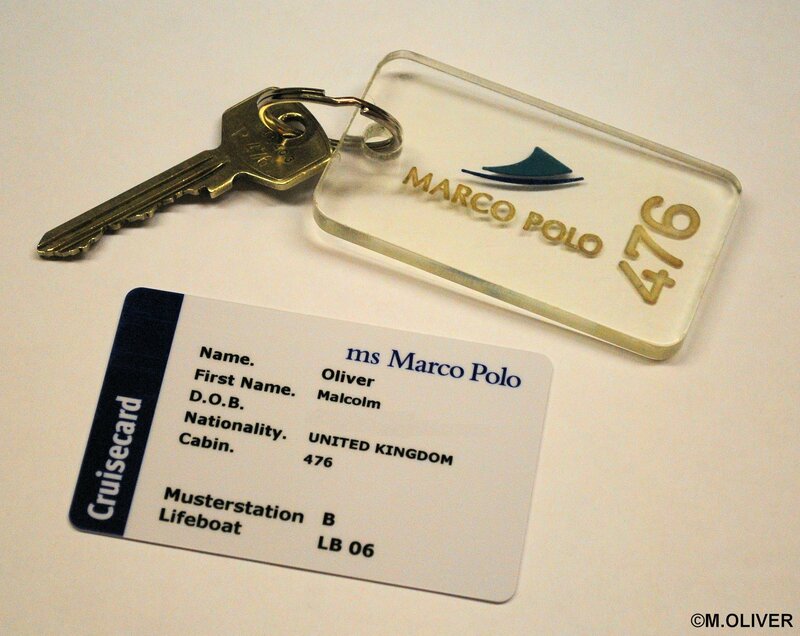 The Marco Polo is not priced or sold as a five-star product. Older ships generally appeal to older passengers and Marco Polo is no exception. The ship is also adults only. This review is base on four cruises that I have taken, spread over seven years. The fares paid were some the cheapest that I been offered. Furniture, soft furnishings and carpets have been upgraded over the years, but their have been no major renovations for a decade. The Marco Polo tend to serve Bristol or Tilbury. I have often embarked at Tilbury cruise terminal, on the Thames, in Essex. The Tilbury cruise terminal is a relatively small ‘sleepy’ establishment, but it is steeped in history. Only 60 years ago, it was the nautical ‘Heathrow Airport’ of London. You could board a ship to America, Australia or the Far East from there. It was also used post-war, to bring the first immigrant labour, West –Indians, to our shore, via the ‘Empire Windrush’. The terminal is now modest in size compared to those of Southampton, but is adequate for smaller ships such as the 22,000 gross tonnes, 826 passengers Marco Polo. However a crew member told me that 600 passengers is regarded as ‘full’, 826 would be the all berths capacity, which is a little unusual. There is a car park is conveniently situated right next to the terminal building, although there is an overflow car-park a mile a way in the docks which is sometimes used (shuttle buses with luggage trolleys are provide, in this case). There is a railway station about a Mile away (Tilbury Town, C2C line) although it its heyday the terminal had its own railway platforms. Due to the ships modest capacity, embarkation can be quite quick, if passengers respect their allocated boarding times. Boarding at Tilbury is normally via the ship’s reception area. This is a modest public area with a reception, shore excursion and future cruise desks; there are no twelve story, waste-of-space atriums here. The crew were on hand to personally direct passengers to their cabins, a nice touch which most big lines no longer even attempt to do. Bristol Avonmouth terminal has similar procedures to tilbury, but is a more industrial port. It is worth noting that public buses do not run into Avonmouth terminal, you need a car or taxi. The taxi fare from Bristol city centre is quite expensive. Marco Polo is one of the smallest (and oldest) ships offering cruises from UK ports. She has just 8 decks (numbered 4-11) which also have names. Deck 4, Caribic: has 34 cabins (inside and out) located at the very bow. These are not ideal for those susceptible to sea-sickness. Deck 5, Baltic, has amidships and aft cabins, but no cabins at the bow. The Medical Centre is located on this deck. (I would expect the aft cabins to experience at least some engine noise/vibration). Deck 6, Atlantic deck, has the Waldorf Restaurant (main dining room) amidships and various cabin grades aft. Deck 7, Pacific, has a variety of cabin grades spanning the entire deck. Deck 8, Magellan, features most of the public rooms: forward is the Marco Polo show lounge, towards amidships Captains club (bar/lounge), main lobby (amidships), moving aft: Palm Garden, shops, Columbus Lounge (bar), Library and card room. Aft Marco’s restaurant (buffet) and a lido deck area, with outdoor swimming pool. Deck 9, Amundsen, 6 forward facing cabins, many amidships cabins overlooking the prom deck, 8 inside cabins, aft Scott’s Bar with lido deck area. Deck 10, Columbus, has 5 large forward facing cabins, 14 superior twins (10 with lifeboat obstructed views) and 4 inside cabins. Aft is the beauty salon, internet café and ‘Jade Wellness Centre’. Deck 11, Navigator, this deck features the highest grade of cabins: 6 deluxe suites forward, 18 premium twins, 2 junior suites (all cabins with obstructed views). The aft open-deck has whirlpool tubs. 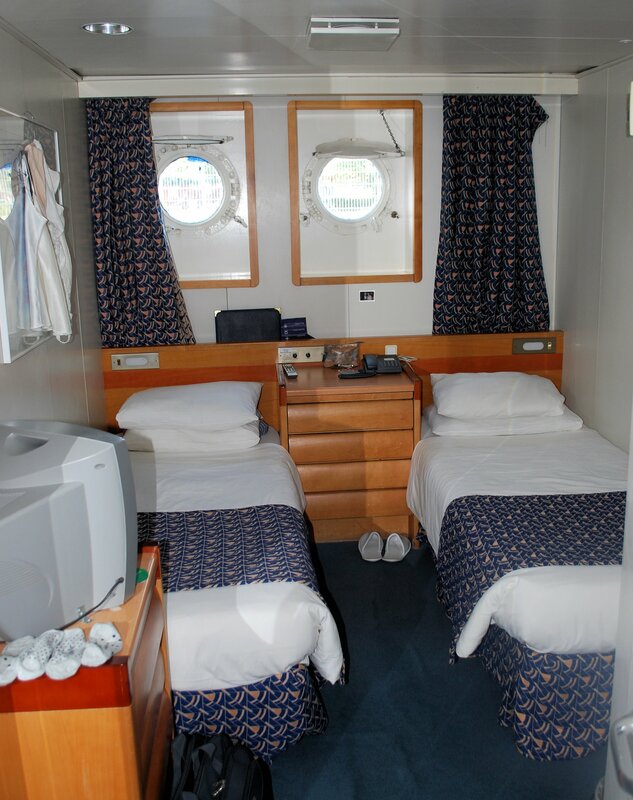 Marco Polo has 15 different grades of cabin. They come in many different sizes, shapes and configurations, even within the same grade. Some cabins have one porthole, some two, likewise with windows. You will not find any very opulent suites on this ship, compared to those on-board new ships. Although some cabins are of course bigger than others. There are no balcony cabins on this ship. The largest accommodation is found on deck 11, with six De Luxe Suites: these have a separate living room, and marble bathroom with bath/shower, walk-in wardrobe, refrigerator, and a TV set/DVD unit. There are two slightly smaller Junior Suites. I have stayed in the more modest cabins: 476 (inside, Pacific deck 7 ), 241, 217 and 219 (standard twin, twin porthole, Caribic deck 5). All cabins are a little dated in appearance, but are very clean and perfectly functional. Many are compact, with limited floor space (particularly 217/9), but storage space/wardrobes are quite adequate for two weeks. Many have two small single beds. In some cabins, the two beds can be pushed together to form a double. Cabin 476 (Cat 3, Superior Twin Inside, Pacific deck) has a little more generous floor space than 2017/9, but no natural light. Baltic deck cabins have two portholes, but in rough sea condition the ‘deadlights’ are closed over the portholes making your ‘outside’ cabin an ‘inside’ one. It is worth noting that the ‘Baltic’ deck feels a little like ‘steerage’ as it is located near machinery spaces. It is not unseal to see a engineer in a boiler suit walking the corridors. There can sometimes be the faint smell of diesel in the corridor, but not normally in the cabin. It is also near the gang-way location and just two flights of stairs below the main restaurant. However, many of the cabins are low and in an amidships location – ideal for the motion sensitive. The bathroom modules in most cabins are compact and clean. The standard showers have a hoses and curtains. Unfortunately the shower pressure is often low and some cabins suffer form fluctuating water temperature. There is a hair-dryer on the bathroom wall, but for safety reasons it is the hot-air pipe sort. Never the less it worked quite well. The toilet was a proper ‘water flush’ one and not the ear-popping ‘vacuum’ type. Small bottle of budget shampoo, body-wash and conditioner are provides as well as wall mounted dispensers for shampoos and hand-wash. Why offer both? The cabin TV’s have been upgraded to small LCD types although reception/picture quality is not always that great. A small selection of movies rotate daily. The cabins have modern safes, although some are quite small – you might not fit an SLR camera in, or I-Pad, for example. All cabins have Air-Con, but in some cabins it is impossible to achieve a truly ‘cool’ cabin. Some passenger decks are clearly hotter than others too. In fact the temperature in public rooms varies considerably with the show lounge and main restaurant sometime being too warm and the Columbus bar often being too cool. (A common problem with older ships). On one occasion, while in port the ship was ‘bunkering’ and the smell of fuel permeated the entire ship, via the air-con, including many of the cabins. The cabins have both a European power socket and a US one. The bathroom has a shaving socket. There are NO UK style sockets. I must just mention the ‘sheer’ which is a thing which excites Ocean Liner fans. Proper Ocean Liners were built so that the decks curve slightly upwards towards the bow and stern to give the ship an attractive line (known as sheer). Marco Polo is no exception. When you look down the lower passenger corridors you can see the curve. If you have a cabin at the very stern or bow, you may find that your cabin floor slopes slightly. I particularly noticed this with cabins 405 and 409, Pacific deck, however it probably applies to some others. It’s not a major problem, but it could be a little disconcerting. On all older ships, cabins on the lowest 2-3 decks, at the stern, are likely to suffer from engine/generator noise and vibration. Occasionally there may be strange knocking sounds from the hull. This can be prevalent in roughs seas, which is particularly audible at night. Passengers are issued with a ‘sea-pass’ card in the normal way, linked to you ‘cashless’ account for buying goods on-board. However the ‘pass-card’ is NOT your cabin key. You are issued with a tradition key on a key-ring. The cabin doors do not self-lock either, so you need to remember lock them each time that you leave. The main dining room, the Waldorf Restaurant, is nicely decorated in soft pastel colours. It has single-height ceiling and is unimpressive in dimensions, compared to those on mega-ships, but is intimate and attractive. Windows line the port and starboard sides so you are never far away from a sea view. The centre of the restaurant has a very attractive circular backlit glass centre piece. 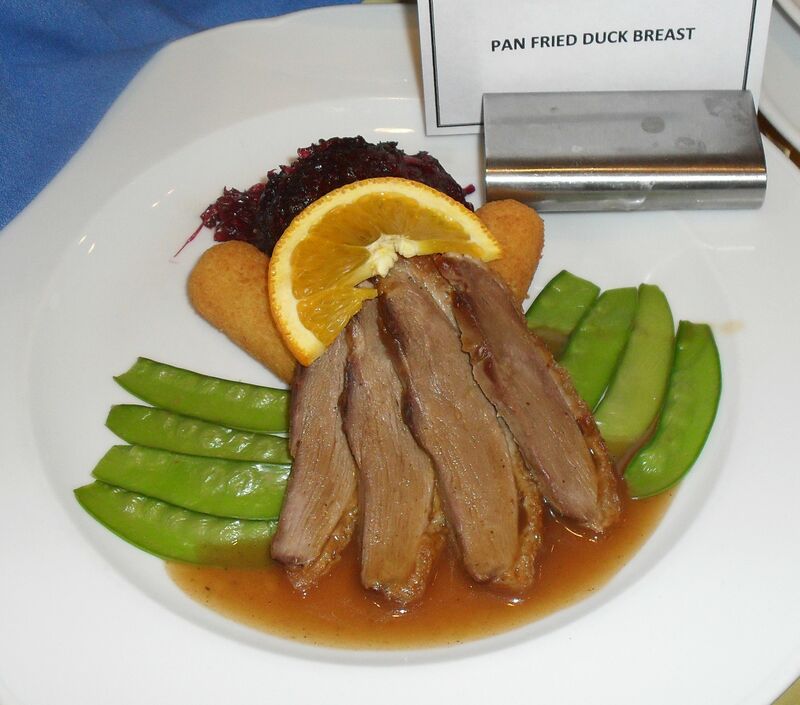 The Marco Polo has the traditional two sittings for evening meal (around 6.00 and 8.00pm) in the Waldorf Restaurant. The dress code was casual, Informal (jacket for men with or without tie) and formal (Tux or suit) although this was relaxed on short cruises. Marco’s Bistro is the informal buffet. (There may 2-3 formal nights per 14 night cruise). However are cruise lines dress codes are become more ‘relaxed’. At breakfast, Lunch and afternoon tea passengers are required to share large tables, with no choice of location or size. Unusually, in the restaurant foyer , samples of the evening food were displayed each evening, pre-meal. I’ve never seen this done on a ship before and have generally only seen it done in communist countries or Chinese restaurants. However I found it very useful to actually be able to see exactly what I would be getting, before I ordered a particular dish. Lunch and evening meal are ‘served’ but breakfast in both the Waldorf and Marco’s Bistro are buffet style. One might expect that the evening meals would be plain cooking in style and of mediocre quality, given the often low fares. 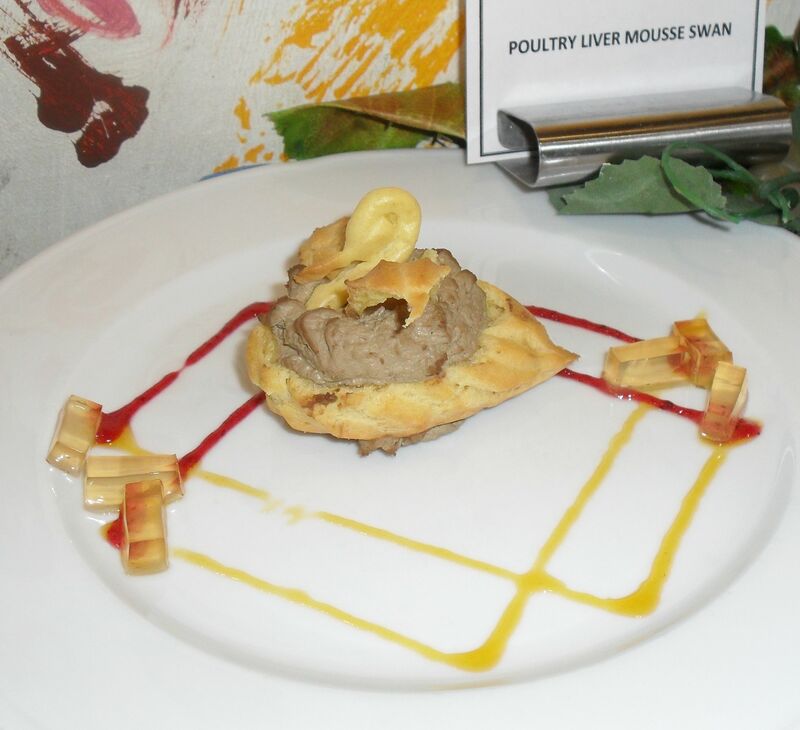 However the excellent quality and diversity of food always exceeds my expectation. I had very good beef, pork, chicken, fish and duck main courses. Starters, salads, soup and sweets were equally pleasing. Many of the waiters on this ship are Russian or Eastern European, along with other nationalities. Some staff look quite serious and are not always very vocal. However they are NOT unfriendly as such and were generally very efficient. Personally I like my waiters to generally be “seen and not heard” especially when serving the evening meal. They are there to do a job. I do not require them to befriend me. However I do appreciate that some passengers prefer more smiles and more banter. Nautical traditions like the ‘Baked Alaska Parade’ and ‘Captain’s Cocktail Party ‘ (with a photo and hand shake) are observed. However chocolate on your pillow each evening is not. The ships photographers consistently make me appear younger in the photos, which I fully approve of. Marco’s Bistro (the buffet) has had it’s furniture and décor updated over the years, but is a little small, and gets a little crowded at times – especially if the additional berths are sold. However I cannot think of any ship where the buffet does not get crowded at peak times. The buffet food choices were not very wide and were generally simple in style, such as Chicken, Beef, Fish and Pasta, Curry, etc. The presentation of the buffet food was not always great either, but fortunately most of the dishes tasted much better than they looked. Hot dogs, burgers, pizza and Panini’s were served outside on the lido deck, from a small kitchen, when the weather permitted. Breakfast was served in Marco’s and the Waldorf, both buffet style. It generally simple in style, such as bacon and eggs etc. The Waldorf had a chef cooking fresh eggs and omelettes, who would often exclaim: “lovverly Jubberly”, Del Boy style. A light breakfast in your room (cornflakes etc.) is delivered for free. Other in-room dining choices carry a fees, unless you are in a Deluxe cabin. 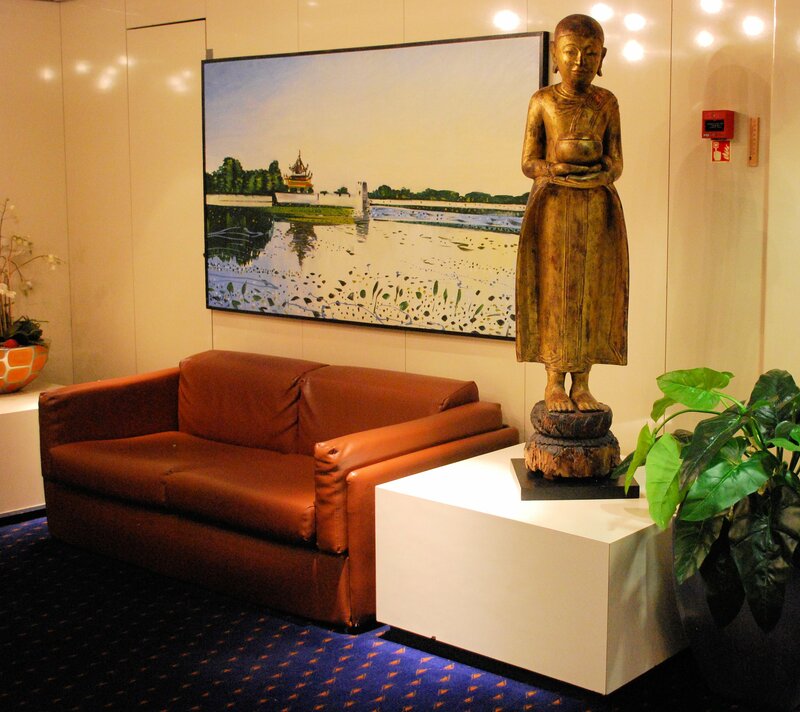 The Marco Polo show lounge is typical design for a ship of this age. Like most show-lounges (and Theatres) it is at the very bow of the ship and is particularly susceptible to the pitch and roll of the ship. Unusually the stage and seating faces back towards the aft of the ship. Most passengers will not even notice (the windows have blinds to create black-out) however this layout could prove disturbing for those subject to sea-sickness. The show-lounge looks a little more dated than most other public spaces on-board the ship as has not be revamped for a long time. It is largely ‘orange’ in colour. It is relatively low-tech. compared to modern ships and has a low stage and non-tiered seating. There are curved rows of fixed seating with small tables for drinks. However some mobile seating has been added in front of these rows to accommodate more passengers, which can affect sight lines. There are also some annoying pillars which can also obscure sight lines, but I suppose they do hold the ceiling up. If you want a good view of the show, it is imperative get to the show maybe 15 minutes early, leaving the evening meal very promptly. The majority of the entertainment is provided by the on-board entertainment team comprising of young singers and dancers. There is normally a very talented live band supporting the shows, which is always so much better than recorded music (Thomson and NCL please take note). Backing vocals are also sung live often from behind the scenes. Personally I usually find some excellent musicians and dancers on-board most ships, but the quality of the vocalists is always somewhat variable*. Marco polo is no exception. (*However I do appreciate that ship-board singers are often required to sing a vast range of material some of which will not be suited to their voices). The shows were often the traditional ‘Flesh & feathers’ type, but they were high-energy and colourful: Broadway Songs, Abba, Queen, Rock & Roll, Joseph and Technicolor Dream Coat etc. featured. One young couple that I met on-board enjoyed the shows, but described them as being a bit ‘Cheesy’ which is a pretty fair description. ‘Daniel’ the guitarist and DJ is a CMV stalwart, having been with them approaching a decade in 2019. He’s performed on various CMV ships – and long may he do so. There were several more ambitions shows: the band perform a Jazz set, their was a Russian Folk show (mainly sung in Russian) and an African show. The majority of passengers really enjoy the shows, including myself. After the main show each evening there is a half hour cabaret at around 11.00pm in the more intimate ‘Scott’s Bar’. Up to three of the ships singers would sing to backing tapes. Due to the small size of the venue this was often very atmospheric, but at times it can be could be standing room only. However it is not a very stable area of the ship in rough seas. Personally I feel that this type of entertainment (which is not unlike Thomson’s) works very well in an intimate show lounge but would probably fail in a 1,000 seat theatre. The cabaret was followed by disco music into the early hours which was always surprisingly well attended. I was lucky enough to be entertained by the multi-talented cruise director Richard Sykes for one of my MP cruises. He has a great voice and also plays the piano. In fact he is the most talented cruise director that I have ever had the pleasure of sailing with. Four enrichment lecturers were on-board my 12 night Baltic cruise which was a very generous allocation and greatly appreciated by many. A craft workshop was also offered. A violin/piano duo and a singer/piano duo played in various locations around the ship. There was no live music on deck which may have been due to space restrictions, inclement weather or the desire to make sunbathing a peaceful experience. Excluding the show-lounge, the Marco Polo has three main bar/lounges. Unfortunately there is no forward observation lounge on-board the Marco Polo. However, Scott’s bar (deck 9, aft) with a rear view, was my favourite lounge. It is particularly attractive, atmospheric and has a small stage for low-key entertainment. The Columbus Lounge (deck 7 ) is very intimate and has a nautical theme, complete with a ship’s wheel and globe. The Captain’s Club (also deck 7) is the largest bar/lounge on-board and has contemporary décor, a piano/bar and a small dance floor. The cost of alcoholic drinks is very reasonable and a big attraction for British cruisers, compared to the much higher prices on US ships. A range of drinks packages are now also offered. The Palm Court (below) is an area with wicker furniture, palm trees and windows offering sea views along one side of the space. Meals can be carried from the nearby buffet to there, if seating is in short supply. The orange décor colour reveals that it has also not be refitted for many years. The furniture has not change for quite a while either. The Marco Polo has the classic ‘fantail’ stern, with a teak wrap-around promenade deck, open-air swimming pool (aft) and lido deck area for the buffet. Joggers and walkers can partially circumnavigate the ship one deck above, on a narrow path, although this route is past various noisy air-intakes. Not having been on a proper sunshine cruise on the MP, I cannot comment on the amount of sunbathing space, although it looked to be reasonable. However few ships ever seem to have quite enough. A Health Spa was added to Marco Polo in a later refit. It contains a small beauty salon, a sauna and treatment rooms for messages, facials, and other pampering. The spa treatments have a Far Eastern flavour. None of the facilities are particularly extensive as you would expect on this older/smaller ship. The ship has a reasonably priced laundry service (one day or overnight) but there are no self-service laundry rooms. I enjoy big new state-of-the-art ships and their amazing range of facilities, but the older/smaller ships have a friendliness and intimacy that mega-ship can never hope to emulate. Smaller ships always have many idiosyncrasies, but are easier to navigate for those passengers with mobility problems. Personally I find it so much easier to fall in love with a small ship. The success of any cruise can come down to ones expectations. The Marco Polo does not claim to offer a five-star experience and is often priced accordingly. However, I did not feel that I was simply getting a second-rate product. Nearly every aspect of Marco Polo’s operation exceeded my expectations, given the size of the ship, its age and the low fare that I paid. The internal décor and repair was generally good and clean, (although not immaculate like Astor) the cabins were at least adequate, if not better. The food often exceeded my expectations and the entertainment was very good in a non-ambitious way. However all older ships seem to have plumbing, air-conditioning and noise/vibration issues. You will need to overlook these. I think the Marco Polo will appeal to those who enjoy a friendly British style product, with some evening formality, at a reasonable price. Fred Olsen regulars, P&O fans of their smaller ships and Thomson regulars should seriously consider this ship. Likewise, those passengers who have only ever experienced mega-ships should try out the MP to see what ‘real’ cruising is all about: no rock walls, no water slides or ice rinks, just sea views, good company and some surprisingly good food. Thank you Graham. The information you have given is very helpful. I have done 2 cruises on MP, one to the Baltic and the one Janice did to Norway. There is no self-service laundry on board, you can have items cleaned by the ship’s laundry but this is ‘at cost’. As others have said, you can do your ‘smalls’ in the cabin and hang them to dry on the line in the shower. The ship is, to me, a perfect size but Marco’s Buffet can be crowded when the ship is full if the weather is inclement. In fine weather you can dine al fresco and there is plenty of room. On our last cruise we ate there most evenings too, as it is very relaxed and not usually busy. Thank you for this helpful Information, Janice. We did the Amazon trip this year……excellent…..the only laundry on board is what you leave out in the special bags in your cabin, it is taken away and returned within 48 hours……..small items, shirts can be done in the bathroom and there is a clothes line in the shower for your use. Hi Christine, every ship has good and bad reviews on the net. You will have to make your own mind up. MP’s product is not unlike that of Thomson and the feel of the ship will be similar to ‘spirit’. There is nothing much at the Tilbury port area. There are a few travel-lodges/Premier Inns a few miles away on motorways etc. The area is NOT a tourist area. The only Parking that I know is at the cruise terminal itself. If you do not want to drive, you could take the train to ‘Tilbury Town’ (from Fenchurch Street, London) then a cab the last couple of miles to the terminal. (You could stay overnight in London at the Tower Hill area – there are several hotels next to the station). All old ships have some vibration. You may be fine on deck six? Unfortunately the Norovirus can strike any ship. It’s not normally very serious, just unpleasant for a few days. I can’t remember about laundry facilities. Anyone? I see no reason why you will not have a great time as long as you realise MP is NOT a ‘Rolls Royce’. We did a Norway cruise on this ship in May, and although we enjoyed it would prefer a bigger ship next time with a slightly younger clientele. We found the cabins fine, food good, entertainment good, yes there are laundry facilities. You will find that for the first 2-3 days of the cruise only the staff can serve you in the buffet area. Thus us a real pain and really annoyed me until I found out it us because if do done comes on board with noroviris it is only contagious for 24-48 hrs, so this makes good sense. We didn’t hear of anyone becoming ill. This ship us an old girl, quite traditional, but everyone enjoyed we spoke to and the passengers and mist of the staff were brilliant company. Enjoy! I booked, just yesterday, to go on the 42 nights Amazon cruise with my husband in January 2015 and then this morning have read numerous bad reviews that left me wondering if we have made a mistake. Your comprehensive article and comments from some former passengers are more reassuring. We have done one Cruise on Thomson Spirit to Norway in 2009 which we did enjoyi. In spite of mostly not good weather. We too, like Mary Walker, are travelling from the north east. We are debating whether to travel Sunday and stay overnight somewhere but the Port area does not seem to be the place to stay. We would appreciate any advice on parking for the 6 weeks. Also a’re there any laundry facilities on board Marco Polo? It is a worry that several recent cruises on Marco Polo have experienced Norovirus. We have been allocated a cab I n towards the rear of deck 6 and notice you mention could experience vibration and engine noise. Any advice would be appreciated. Yes Geoff – I think the intimate ‘show lounges’ on-board older ships are MORE atmospheric than the big theatres on newer ships. Hi Mary, wow that is a big trip. I cannot tell you what 42 nights will be like. I assume that you are not driving. Tilbury cruise terminal is a couple of miles from the station ‘Tilbury Town’. You would be able to get a taxi from there. Tilbury Town is on the Fenchurch Street Station Line (from London). The trains are about every half hour. The journey from Fenchurch street is around 40 minutes. There may be some coaches running to the port? Check with CMV. Enjoy!